Fresh off of its debut at SXSW Film Festival, where it won both the audience award for documentary and a special jury citation for “political courage”, Vessel is an electrifying look at Dr. Rebecca Gomperts’ activist group Women on Waves. Founded in 1999, Women on Waves is an organization that aims to offer safe abortions to those in countries where abortion is currently banned. With close to 47,000 women dying each year as a result of illegal and unsafe abortions, Gomperts’ team aim to put the power back in the hands of those who need it the most. Sailing the high seas like pirates of freedom, literally cutting off the ropes of police oppression to make their escape at one point, Gomperts’ team frequently exploit the loopholes of international waters laws. 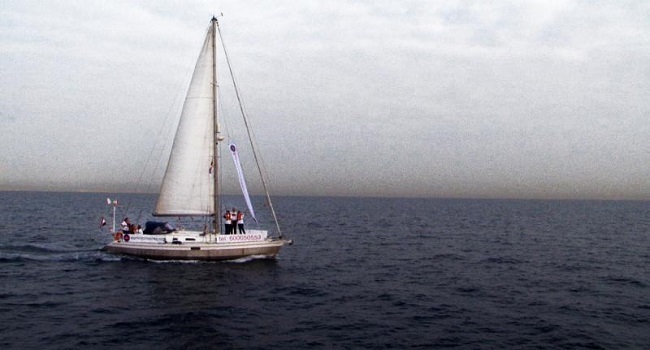 Using a Dutch ship as a floating clinic, since abortion is legal in Gomperts’ homeland of the Netherlands, they sail from country to country answering the distress calls from women everywhere. Women on Waves not only facilitate abortions at sea, by providing World Health Organization approved pills, but they also educate women all over the world on how they can handle the procedure themselves. For Gomperts it is all about empowering women to make their own choice about their bodies. Spanning a little over eight years, director Diana Whitten provides plenty of insight into how Women on Waves went from an experiment to an underground activist movement within 23 countries. She also highlights the numerous struggles they face. These include initially sailing without a full license to practice; government orchestrated blockades; threats of having the identities of the women they served exposed publicly; and numerous protests. While Gomperts is portrayed as the fearless leader who is willing to calmly express her views in the face of seething protesters; it is actually the volunteers, and the faceless women in need of assistance, who provide the film with its heartbreaking emotional punch. When it comes to hot button issues, there are few as blisteringly polarizing as the topic of abortion. With all of the discussion centered around morality and religion, not to mention the political posturing, it is easy to lose sight of the women at the core of the debate. This is one reason why the emails Whitten incorporates, sent to Women on Waves from women ranging from Ireland to Iraq, speaks louder than any of the statistics she puts on screen. Their messages recount tales of fear, isolation, raped, botched illegal abortions, and being shamed into silence just to name a few. At times Vessel may seem like it is slightly weighted, but it is important to remember that Whitten is not interested in rehashing the same old debates. Frankly, it is doubtful that those who protested against Women on Waves, and hurl eggs and other obscenities, will even bother to see the film. Instead Whitten presents a fascinating portrait of what can be achieved in the face of seemingly insurmountable adversity. Vessel tells an extraordinary tale that needs to be seen and discussed. It cuts through the rhetoric and forces us to really take an honest look at the women who are often forgotten within the abortion debate.